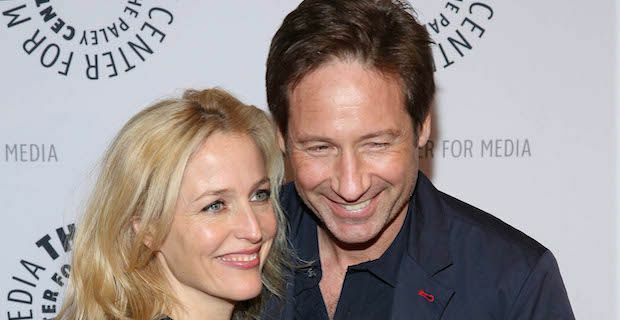 It's official folks, Mulder and Scully are back on set for the filming of a new season of the X Files. The show is set to return to screens for a special season and shooting is currently in full swing in Vancouver, Canada. David Duchovny and Gillian Anderson were snapped in character and back in front of the camera. The image shows the crime busting pair sitting side by side in the back seat of a car which is in front of a green screen along with a message tweeted by @thexfilesfox reading "EXCLUSIVE: Your first look at Mulder and Scully! #TheXFiles." Also in the image, fans can spot director Chris Carter sitting in the director's chair wearing headphones and overseeing Mulder and Scully's performances. The season will comprise of 6 hour-long episodes and is due to hit screens in early 2016 with fans eagerly anticipating what direction the characters will go.